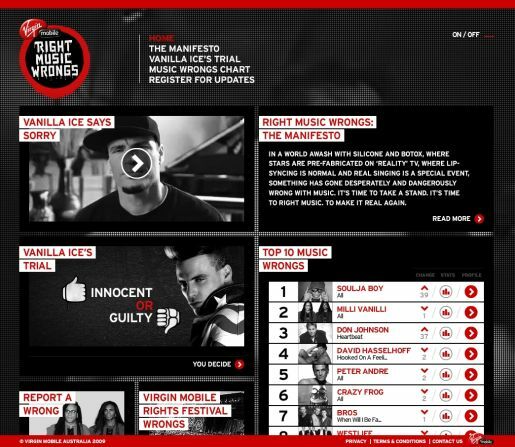 Virgin Mobile is promoting its new music related site, RightMusicWrongs.org, with an apology from hip hop artist Vanilla Ice. Viewers are invited to register online, vote on Vanilla Ice’s apology, and help determine the Top 10 Music Wrongs. The 1980s rapper, whose real name is Robert Van Winkle, apologises for his track, Ice Ice Baby, his hair and his baggy pants, all part of an invitation to mobile phone users to vote on winners and losers in the music scene. Since being placed on YouTube on Wednesday 4 March, the Vanilla Ice apology has been viewed over 300,000 times, attracting more than 1,700 comments. The original film is currently the #1 Most Discussed, Favourited and Commented music video on YouTube in Australia and is gaining considerable traction as far afield as Canada, India and the UK. The campaign has also been featured on global news site The Huffington Post, where it generated 6,000 additional video views within 3 hours and in the Sun Newspaper in the UK. Vanilla Ice takes his apology to the streets, using a megaphone to get the message out, “I’m Sorry”. Vanilla Ice takes to the phone to convey his personal sense of regret to those people affected by Ice Ice Baby. The first phase of the campaign culminates with on ground activation at V Festival in Sydney (28 March), Gold Coast (29 March), Melbourne (4 April) and Perth (5 April) where Virgin Mobile will right music wrongs by providing customers with a VIP festival experience. This includes priority entrance, use of special viewing platforms at the main stages and access to the Virgin Mobile Louder Lounge where they can enjoy an exclusive bar and have the use of VIP toilets. During the next month, the campaign will be supplemented by a series of online and print ads in major metropolitan newspapers, free street / music press and major online news destinations such as ninemsn and music sites such as Faster Louder and InTheMix. The campaign was developed at Droga5 Sydney by executive creative director David Nobay, art director Ben Smith, copywriter Ben Akers, agency producer Allison Chambers and digital producer Brett Mitchell. Filming was shot by Trent O’Donnell via JungleBoys Productions with producer Chloe Rickard. Editor was Paul Swain.